My wife got me the Limited Edition R2-D2 Xbox today, but will have to wait until tomorrow to connect it…I am so happy! Now I must go get my old 360 HD backed up. This entry was posted on April 4, 2012 at 10:06 pm and is filed under Uncategorized. You can follow any responses to this entry through the RSS 2.0 feed. You can leave a response, or trackback from your own site. We need a new Battlefront game to play on that thing. I am hearing rumors about a new Battlefront, but I’ve been hearing them for awhile. The old platform works, 3rd person shooter, and as much a fan I am of the Clone Wars series I feel that it has kiddie(ed) up the Star Wars brand. But nonetheless the rumors are about a 3rd person shooter, of a Well Known Sci-fi that involves sword(light saber) fighting in it. Kinect Star Wars looks cool but I’m hearing a lot of bugs. That was long sorry Bro. Yeah, I wasn’t keen on the Kinect Star Wars game way back when this bundle was first announced, but figured that it would get better as it got closer to release…apparently not so. Just unloaded my copy on eBay this morning to a buyer in MI. Hope they enjoy it as I know it would only collect dust in my house and looks like it might be fun for the younger audience. Oh I like the show, don’t get me wrong, the Clone trooper characters, the expansion of old characters, Jedi and Seps, how the clones are portrayed as more human than droid-like, and as individuals, love it. Plus its inspiration for custom figs and dioramas. Yes the darker aspects are cool, and I don’t miss seasons, I watch them all, I have all 3 on dvd, and will get the 4th. I love all things Star Wars. I’m reading “Darth Plagueis” now, and its got me watching TPM and AOTC, no really. So yes a huge fan. Are ya going to Star Wars Celeb in August? And what are you hearing about Season 5 Clone Wars? Lucas always said he would make 4-5 seasons regardless of ratings, and ratings are awesome, so? Anyhoo Dude take care of yourself and I’ll be in touch. Star Wars Celeb in August…probably not. I’ve got to save the pennies to make a trip to British Columbia in the fall, so that is where the trip is heading in 2012. 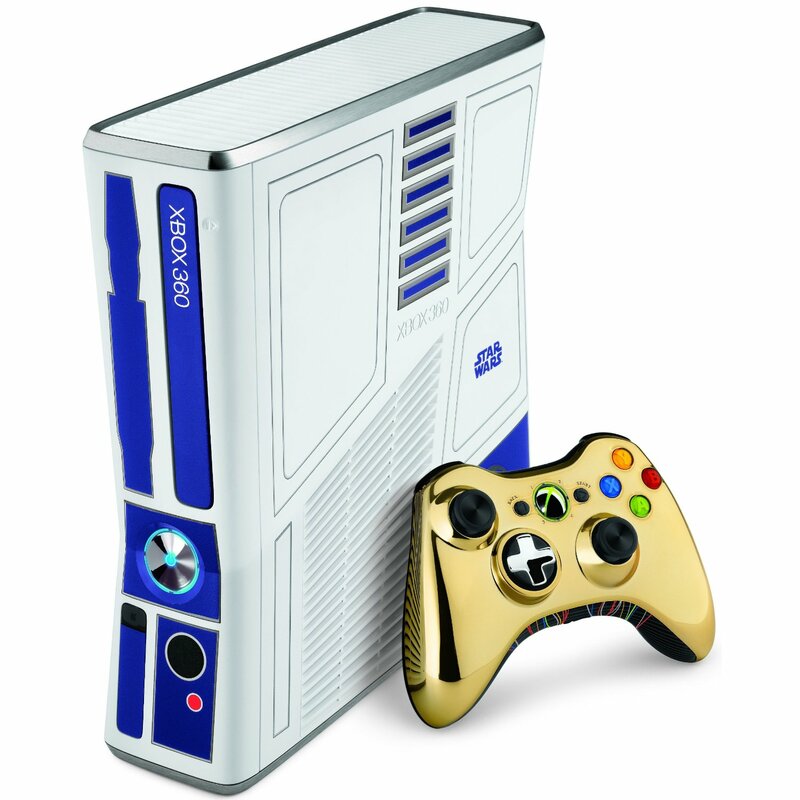 R2 xbox, must have, I’ll get one. I’m gonna try a Darth Plagueis custom. Luceno the writer of ‘Darth Plagueis’ is a good Star Wars writer, if you haven’t read “Rise of the Dark Lord”, or some of his other titles, you are gonna have to. Amazon has ‘Darth Plagueis’ pretty cheap. IGN article I will check it out, I work right now in Afghanistan, private military contractor, but I’ve a trip planned for 7 days in Orlando for the Convention. Sorry if there are too many posts on here bro. Keep the customs rollin. Afghanistan…my brother is heading over there in the next week or so. He’ll be deployed in the Kandahar province for the next 10 months (National Guardsman). Be safe mate! I’ll definitely check out the Plagueis and Rise of the Dark Lord books…my interest is really piqued . I’d love to see what you come up with Darin for your Plagueis custom! Man you are in for a treat with ‘Rise of the Dark Lord’, I wish I could read it again for the first time, yeah it has some really cool stuff in it, it would make an awesome clone wars 3 or 6 part series. I’ve been to Kandahar back in 2002 with the Army and that is one hot place during the summer. I’m gonna use an avatar figure for the Plagueis, because they are thin like muuns are, I may try and mold the face from San Hill figure, I wish I had Sithfire’s skills with Fixit and sculpy, u must know that guy? If not check him out. Ok later Bro. “Dark Lord: The Rise of Darth Vader”, thats the right title name.